Nylon production is responsible for nitrous oxide emission through its requirement for adipic acid, (CH2)4(COOH)2, as a precursor. Adipic acid is a fine powder also used for some plastics, clothing, carpets and tyres, and in the production of dyes and insecticides. Nitrous oxide arises from adipic acid production during the oxidation of a ketone-alcohol mixture with nitric acid. It is estimated that for each kilogram of adipic acid made, around 30g of nitrous oxide is also produced. Although global adipic acid demand is expected to increase, N2O emissions from this source are expected to continue to decrease substantially, as they have since 1996. As reported by industrial sources, the decrease is a result of the installation by nearly all adipic acid producers of N2O abatement technologies. The main technologies used to reduce nitrous oxide in the adipic acid industry are catalytic decomposition and thermal destruction. These methods convert nitrous oxide into nitrogen and oxygen. 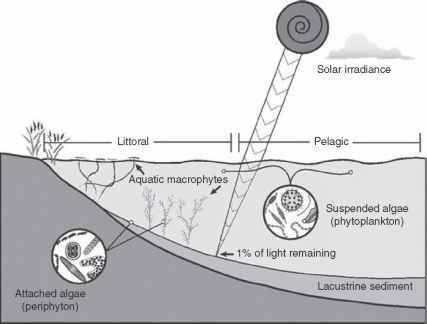 Catalytic decomposition operates at about 500°C and thermal destruction operates at and above 1000°C (Shimizu et al, 2000). Other than these processes, there are reports of a method that consumes N2O as an oxidant for phenol synthesis. Shimizu et al (2000) give a detailed description of the technology for each adipic acid-producing company that has been made public through their patent applications. Briefly, the catalytic decomposition of N2O uses, for example, a spinel-type CuAl2O4, a catalyst with Ag and CuO supported on Al2O3, a catalyst with Ag supported on Al2O3, or CoO and NiO supported on ZrO2. When the catalysis is around 500°C, using the off-gas from the adipic acid production process that contains 23 per cent N2O, all of these catalysts give a decomposition rate of 99 per cent or higher. The thermal decomposition of N2O leading to N2 and O2 is exothermic; however, it leads also to the formation of NO, which can be recovered as nitric acid. Using these reduction technologies allows the adipic acid manufacturers to reduce N2O emissions by 90 per cent or more. Figure 9.7 shows as an example the estimated US nitrous oxide emissions from industry by source from 1990 to 2007. 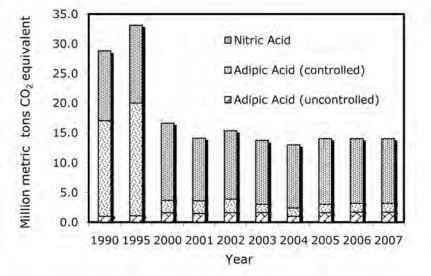 For adipic acid production, N2O abatement is estimated to have improved from approximately 32 per cent in 1990 to approximately 90 per cent in 2000. The current efficiency range of abatement technologies is 90-99 per cent reduction of N2O emissions.